Ch. Lafite Rothschild produces an elegant style of Pauillac. Its character displays cedar, cassis, tobacco, truffle, and spice along with a freshness and purity of fruit on the nose and palate. Quite possibly the most refined and elegant of all the First Growths. Just like all the other First Growth’s it can take decades to reach full maturity. It is a wine with remarkable longevity. 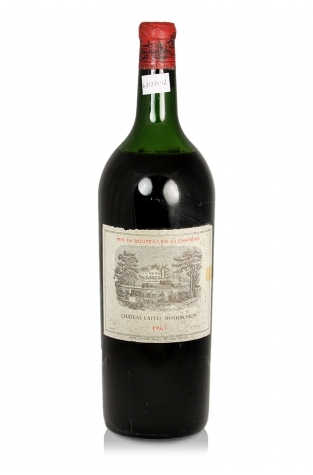 The blend for Chateau Lafite Rothschild varies with each vintage depending on the character and quality of the grapes that year. In general the amount of Cabernet Sauvignon in the blend ranges from 80% to 95%. Merlot is usually between 5% and 20%. Cabernet Franc and Petit Verdot usually vary from 0 to 5% of the overall blend. This magnum of Ch. Lafite Rothschild 1963 is now into its sixth decade and will be most likely to appeal to the serious wine collector or quite possibly to someone to celebrate a birthday or important anniversary.